I was recently approached and asked to describe my experience of being a single person traveling in Costa Rica alone. What made me decide to travel by myself? Why do I love it? What challenges have I faced, and what tips would I give to other women who want to do what I’m doing? Wow, I thought, that’s a pretty loaded bunch of questions! So, I gave it some serious thought and reflection. What I decided is that traveling alone is a priceless experience that I recommend to anyone, and while being female adds a unique component to my international adventures, the challenges I face and the advice I have to share are my experiences that are applicable to both men and women alike, in Costa Rica and around the world. Why Do I Love Traveling Solo In Costa Rica? Nothing challenges me or pushes me to the limits of my comfort-zone quite like going to a foreign place. It is within these new environments that I am exposed to parts of myself that I didn’t even know existed; fears, perspectives, biases, world views, value systems, and deeply imbedded cultural norms. I am forced to analyze the world through new lenses. I’m asked to interact with others and I’m allowed to participate in diverse ways of life. While these experiences challenge me and can sometimes be difficult, it is undeniably one of my favorite parts of traveling by myself. When I get out on the road alone I get to see the world on my schedule. Traveling with others is fun, but at some point every travel companion is going to have a different opinion of what they want to do, where they want to go, or what they want to see. 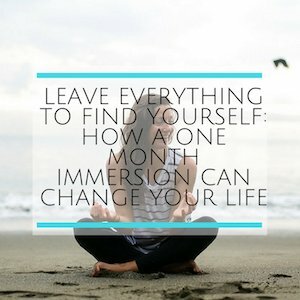 Traveling alone offers a unique sense of autonomy; I can go where I want, when I want. By not bringing a buddy along I am forced to make friends. While traveling with someone else can be great, it is natural to spend most of my time with that person. By going out into the world alone I am forced to meet other people. Coincidentally, many of the people I encounter are other solo-travelers. READ MORE About How To Get Over Your Fears! Since I don’t want a photo album full of selfies, I have to reach out to strangers constantly to capture myself on film. At first this felt a bit unusual. I didn’t want to bother people. But after a few rounds of, “Excuse me, would you mind taking my picture?” I realized that people are more than willing to snap a shot or two, so now I just go for it. Plus, I’ve found that approaching people like this can be a great way to make friends! Being on the road alone means that I often find myself, yup, you guessed it, alone. At times it can get lonely, however, it creates space and time for me to reflect, and while the time alone can be productive, I know that if I make an effort to connect with people around me, whether that is on a bus, at a coffee shop, or in a market, I will often find someone to share a meal with, grab a drink or even embark upon the next leg of my adventure. So, my “loneliness” only lasts as long as I’m unwilling to get out and meet new people. As with any journey, I couldn’t move to a new place and explore a foreign country without leaving important people and places behind. It was really scary to step away from the familiarity of family, friends and home. However, the discomfort of departure has always been outweighed by the experiences I have acquired through my travels. 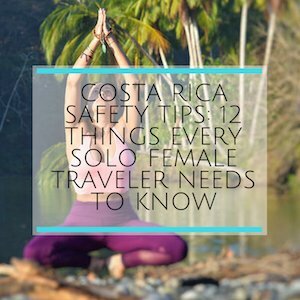 Safety is probably the most important issue for anyone traveling alone in Costa Rica or anywhere else in the world. (Though keep in mind, Costa Rica is the safest country in Central America!) However, it can be more dangerous at times for women than for men. Whether your travels are taking you just down the road or across an ocean, there are some simple guidelines that can keep you safer and help prevent potentially dangerous situations from arising. You cannot travel with fear, but it’s important to pack a healthy dose of cautiousness and remain conscious of your surroundings while you’re on the road. Here are my top 5 safety tips that I would offer to any woman who’s thinking of traveling by herself. 5. Do your homework – Don’t go into a new situation like an ostrich with your head in the sand. Make sure you research the country you’re visiting. Know ahead of time how the women your age dress. Study some key phrases from the language. Learn the taboo gestures, body language, and the general faux pas of the culture. Knowing the nuances of the environment where you’re going allows you to avoid potentially dangerous situations. 4. Walk fast – Know your destination and walk there quickly and confidently (i.e. don’t stand in the middle of town looking confusedly at your map). Keep pace with the stride of the people who are walking around you. You will stand out less and give the impression that you are familiar with the territory. 3. Stay alert – Keep your eyes and ears open. If you have the feeling you are in the wrong place, chances are you probably are – so get out of there, fast! If you plan on drinking, limit your alcohol consumption. You become an easy target when you’re clearly intoxicated, especially in a foreign place; the difference that a drink or two can make may be the small difference between clear judgment and a bad situation. 2. Cover up – Dress conservatively. I would love to stand on my feminist soapbox and say that it shouldn’t matter what a woman wears (or anyone for that matter), but unfortunately, in most parts of the world today it does, and especially if you are by yourself in a foreign country. Prevent a problem from arising by being proactive. Wear long pants or skirts and cover your shoulders. If it is customary for women to cover their hair, feet, ankles or hands, make sure to know this ahead of time – even if you are just passing through – and dress accordingly. The less you stand out the safer you will be. 1. Get curious – Ask questions. The people around you – your taxi driver, the employees at your hostel/hotel, or fellow travelers – are excellent resources. Where is it safe for me to go? Where is it not safe to go? What should I watch out for? Is it safe for me to be out at night alone? Is it safe for me to get in a cab at night alone? Knowing which situations are potential safety risks will help you avoid them. Use the knowledge of the people you are surrounded by to keep yourself safer when you venture out by yourself. Go for it! If you’ve had the dream or desire to travel and see the world – do it! There will always be excuses not to go, people who will try to dissuade you, or fears that will attempt to hold you back. At some point you have to just make the choice and go for it. The world is out there waiting to be explored, so if it’s what you’ve always wanted to do, just go do it! There is nothing quite like being a person on the go and getting out into the world to explore on your own. Hitting the road alone will empower you and offer you the chance to know yourself on a very deep level. It helps to challenge your personal comfort zone, lets you plan your own itinerary, and allows you to meet new and amazing people. While there are certain difficulties of traveling by yourself, like finding people to take your picture, dealing with loneliness, leaving family and friends behind, and tackling safety concerns, the experiences and memories that you will gain far outweigh the challenges. Traveling alone as a single woman has been the best experience of my life. To any solo travelers thinking about heading out into the world by themselves I say – go for it! 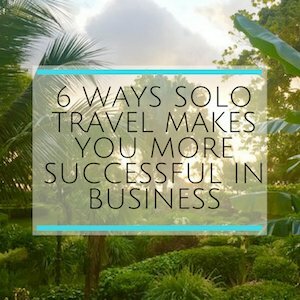 Traveling solo in Costa Rica? 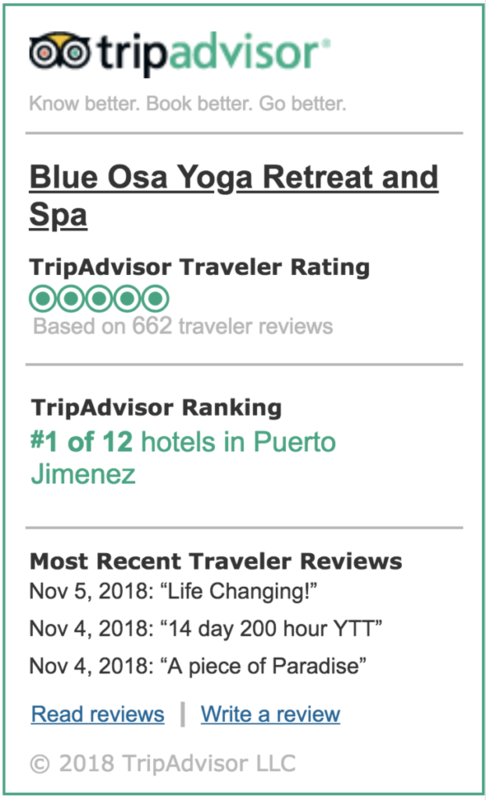 Learn about our amazing individual yoga and spa packages catered to the solo traveler who needs to relax and rejuvenate. Come and Book Now As A Solo Traveler At Blue Osa! Lara is the current garden volunteer at Blue Osa. She is originally from Minnesota and spent the last three years in Colorado. 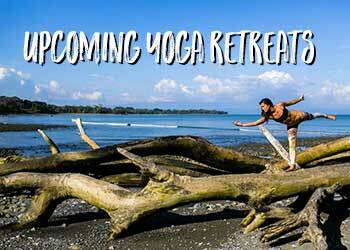 In 2013 she decided to spend a year abroad focusing on travel, yoga & gardening. Hi Lara, my eighteen year old daughter wants to take a bus (by herself) from Puntarenas to San Jose. Is it safe? (She is bilingual). I want her to hire a private driver (I offered to pay for it), but she thinks I am being -horrir of horrors- “protective”! What fo you think? Costa Rica is a very safe place to travel. As in any place, no matter where you are, always be aware of your surroundings. I am quite envious of you as to how can you enjoy so much in Costa Rica all alone and that too with so much of energy? Thanks so much Afzal! 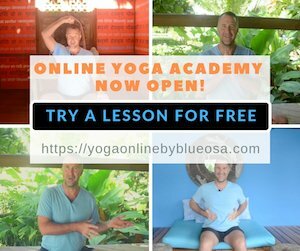 We look forward to welcoming you to our Blue Osa family. And Costa Rica is a very safe place to travel. This was very inspiring. I’m planning my first solo trip away from the hubby and my daughters. This will be my first time traveling out of the country! I have agoraphobia and ptsd so I’ve been really anxious about traveling alone. But reading this gave me a lot of hope. =) Thank you! Thank you so much for your comment. We are happy to help. Lara Healy, aka The Barefoot Blogger, is an amazing woman who is daring and courageous. We have an amazing series in this blog on fear. Please click here to read more! Brave Girl. Very inspired for a new travel blogger like me. Tks for making this article. Looking for more from you in the future. Looking forward to my first solo trip to costa rica! Its time to rediscover myself. Thank you for your encouragement and information. I really look forward to learning to surf and explore costa rica. I’m scared and nervous, but realize the adventure is definitely past my comfort zone. “one two three….leap!” Any other suggestions, please feel free to email me. Thx! I love traveling solo! Do you have any particular suggestions for Costa Rica in terms of the outdoorsy activities? I’m very comfortable being alone in cities (safety in numbers) but wonder how to safely go hiking solo, visit the hot springs, etc. Did you go on any group tours? I so enjoyed reading your post! I solo traveled for years around the US before I took the plunge, and traveled alone for the first time to Costa Rica several years ago. I don’t regret it for a minute, and now live here! One question I got a lot of my first trip that I found a little unnerving, came from fellow travelers, but mostly from staff at the hotel at which I was staying. “Did you come here by yourself?” Looking back, for safety’s sake, I probably shouldn’t have been so honest with my answers; however, I have never felt unsafe in this country for one second–no matter where I am. I would recommend solo traveling to anyone, but especially females. It’s a great self-esteem booster, builds confidence and increases independence. Thanks so much for sharing your story and that extra little useful tidbit of information. That is a great point. I did a lot of traveling alone around Europe for over 2 years in my mid-twenties. I would stop and pick up work at a hostel, etc. and stay for a while before moving on. It was a great experience…lonely at times, great at others…and ya, I had to deal with being harassed on occasion, too, but unfortunately, that’s the reality that women deal with almost anywhere. Now, I am getting ready to visit Costa Rica as a single mom with my two boys. We went to Belize two years ago and had a great adventure and felt safe, although in hindsight, there is always a thing or two you’d do differently. I am very excited about our trip to CR. I wish I spoke Spanish, but the three of us are going to start studying some basics. 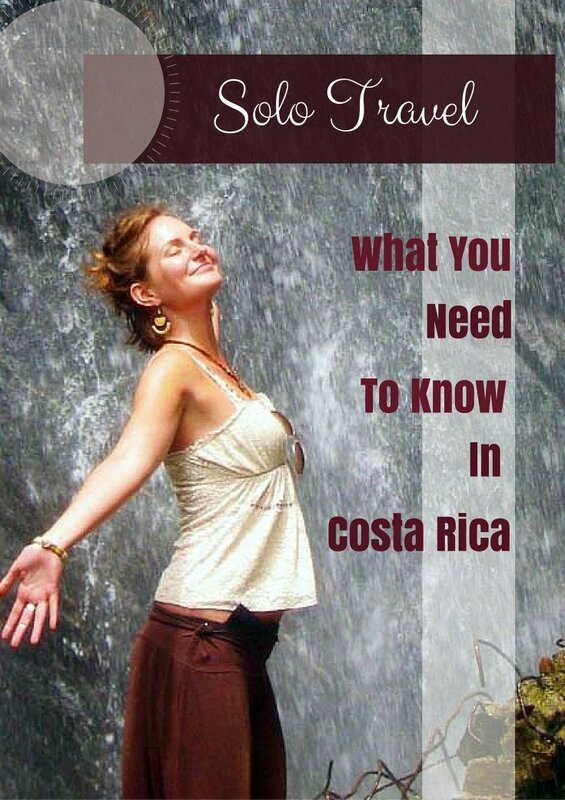 Do you recommend any specific areas in Costa Rica for solo travelers? Blue Osa is a perfect place for solo travels. Click on Book Now to see what is available. I am going to Costa Rica (Osa Peninsula) in 2 weeks for the first time and I’m Going solo. Your article was not only very informative it reconfirmed my decision to go alone. I am going to share your article with everyone that have been telling me not to go alone. Thank you so much! We hope to meet you Victoria. Check out our available to stay with us. Sure! Have you checked us out? Spend some time at Blue Osa. my flight is 9PM arriving in san jose, is it safe to take a taxi at night as a solo girl? Sure thing. San Jose is very safe. Blue Osa is a perfect place for solo travels. I am going to Costa Rica by myself, for two weeks, in February. I’m not nervous about going alone but I’m debating about renting a car by myself. I know it’s really expensive and hard to drive in some areas. Plus there is theft of belongings locked up in car. Do you think I should just stick to busses, shuttles and flights? Didn’t want to hassle with that but renting a car may not be worth it. Use either. Both will be a great way of getting around. Im travelling to Costa Rica alone in Feb for 4 weeks. Needless to say am fairly anxious and hoping I will meet lots of people along the way. I’m unsure where to start my trip, ideally start on a nice beach somewhere for 4-5 days before becoming adventurous and exploring. Do you have any suggestions? Sure Jane. Come to Blue Osa! I read your entry and it sounds very similar to what I’m planning. I will not rent a car. If I book the hotels how easy is to get around. Already know to get from airport SJO to San Jose by public bus. I read about the “gray line” trans… How was your experience,? Oh wow…I just booked my first solo flight last week to Costa Rica and leaving my husband and two teenagers at home. I’m going there from Feb. 1st to Feb. 15…I saw your post and thought…oh wow, another solo traveler going at the same time as me and maybe we can connect so our lonely days are a lot less but then I saw where you were going…I am planning to go to the South Pacific (Manuel Antonio or Uvita)…at least I know there will be other solo travelers during that time…I am excited but also scared. I will be traveling Solo to Costa Rica in a few days, very nervous but at the same time excited. Thank you for your post I am feeling better. 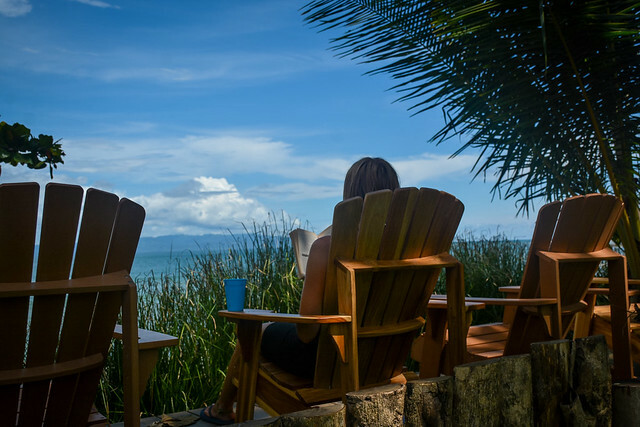 Really great article on Costa Rica, one of my favorite destinations! What are some places you visited and things you did while you were there?